Offline Dictionary. Get meanings of any word & translate full sentences. En<>Hi. 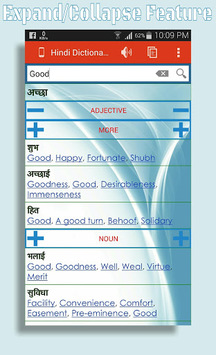 Need a 100% free offline dictionary that can give you the detailed Hindi meanings of any English word? Need to translate a full sentence? * Get the meanings of a word categorized by Noun, Pronoun, Adjective, Verb, Adverb, Preposition, Suffix, Prefix etc. Hindi ✪ English Dictionary ! !